The Mighty Morphin Power Rangers may have the skills and the powers to go toe to toe with Rita Repulsa and her minions, but every good team needs a leader. Someone needs to take command, execute the battle plans, rally the troops, and make sure everything runs smoothly. That’s the role tailored for the Red Ranger. Why the Red Ranger? Well, according to classic Japanese kabuki, the color red always indicates the hero, or leader of the story and the original idea for the Power Rangers comes from Japan. That means they incorporated some of their traditional color values into the outfits of the rangers. That’s why the Red Ranger is usually the leader of the team! Do you think you’re ready to lead? Then you’re going to need the uniform of a born leader! 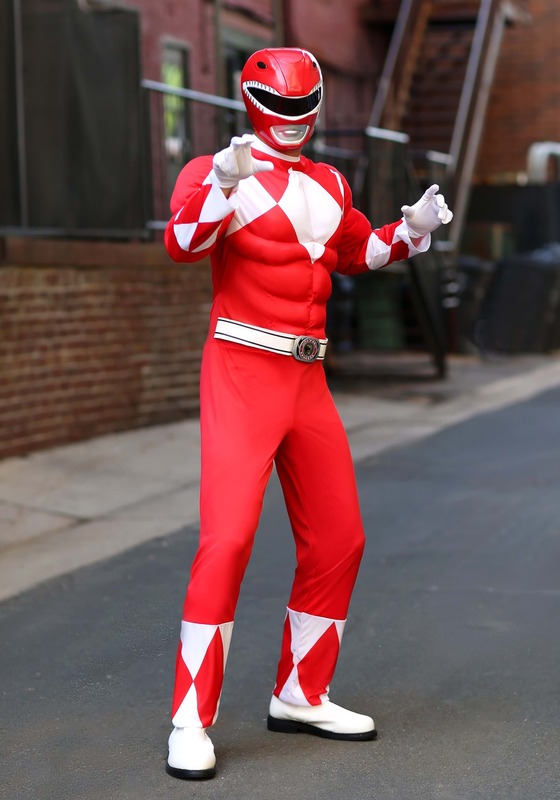 You’re going to need this Adult Red Ranger Costume. It’s officially licensed from the Mighty Morphin Power Rangers, so you can feel confident in your role of leader when you wear it. The top portion has muscle padding in the chest and arms, so you can look like one buff Ranger when you wear it. No trips to the gym necessary to get that strong, heroic physique! It also comes with a Red Ranger mask that helps you achieve that battle-ready look of the iconic leader. Of course, it also comes with the T-Rex Morpher belt to solidify your role as the Red Ranger. The only thing missing from this costume is the T-Rex Megazord! When you dress up in this Power Rangers Red Ranger costume, you should have no problem taking the lead in the battle against evil. Be sure to pair up with the Blue, Black, Yellow and Pink Rangers to assemble the original team that started it all! Even Lord Zedd won’t be a match for you!